I'm new to the scene and would really like to learn more about my new beast and where and how to get the best out of it. I have found my new 2001 DRZ has DR650 forks which don't work very well anymore and have no adjustment other than changing oil level and spacers inside the fork(I replaced the seals as they were shot). I have scored a set of 1999 RM125 forks and triples and was going to put them in. has anyone had any experience or advice for this mod? even if you did get them to fit i dont think they will carry the constant weight of the 400 , much heavier bike. just my thourghts, could be wrong. I have done a bit of homework and it's something that has been done a bit in the states to get USD forks in the bush on the DRZ. To the point of an aftermarket triple clamp being made to reduce the off-set from 24.5mm closer to the DRZ 18mm (production has stopped). The forks I have came directly off a DRZ400. Headset bearings and Axle are the same size in both clamps and the fork legs are longer than the SM DRZ forks so ride height isn't lost. I take your point on weight so I will keep you updated on how it goes. Any other info or support would be much appreciated. 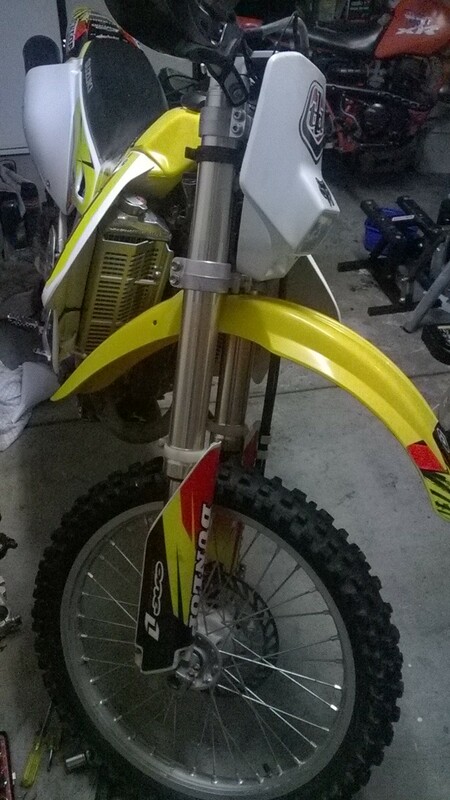 i got my suspention done at MPE on the sunshine coast both front and rear and it is a completly differnt bike to ride cost me $1200 but was well worth the coin. As with drztroy I went the simple option of getting my bike suspension set up for me, Choice Suspension in Kyneton set it up with new springs & re valving both ends & dialed in some base settings. A quick blast at nearby Cobaw soon showed that it had been a worthwhile exercise as the front end felt much better, tracked better & the extreme front end diving when braking hard has been sorted. The back tire now hooks up much better over the rough stuff & makes use of that 400cc grunt. To feel more confident with how the bike handles has the benefit of not only increasing speed but also saving energy & at 100kg & at the wrong side of 50 that's pretty important. Don't get me wrong I don't undervalue the genuine forks on a DRZ. Like I mentioned, due to lack of knowledge I brought a bike which already had the front end taken off and an old DR650 assembly in its place. The price and availability is very hard to swallow at the moment to bring my bike back to Spec. The latest is that I have mounted up the new triples, forks and caliper no problem. The DR650 wheel hub and axle are a smaller, different configuration to DRZ/RM125/RM250. Wheel hub is too small to change out bearings and spacer to suit DRZ and the disc is massive. From the US I have found an 01 RM250 front wheel assembly including disc, axle and spacers for $235 delivered. (I couldn't buy just the wheel/hub for that here unfortunately) Which should work well for me as I don't need the Tacho drive. (I have a trail tech already fitted). Should hopefully arrive end of this week, to try and complete the puzzle and get back out there to test it out. I proberbly don't know the right places to look but I rang around a lot of wrecker all around Aus and there is very little at high prices for either DRZ or RM's. I am slowly getting smarter and have check out the different part No.s from the Suzuki parts guide and it' surprising how much is simular between models for an early DRZ like mine. I will keep you updated, hopefully you guys are somewhat interested. So hopefully a few people are wondering how I went with this modification. The good news is it's done! My new/second hand wheel arrived from the states with a disc which has done very little work as there are no pad wear groves into the disc, My axle/nut and spacers were also in near new condition to the point that the bearings and seals in the hub were too new to warrant replacing. Did it all fit together? Yes, perfectly! As you can see from the photos the spacers fit perfectly in between the forks, axle slides through comfortably. The pads are sitting on the disc exactly where the rub marks are. Nothing was forced to bolt together and tighten up. As you can see I did have to play around a bit with the fork height above the triple clamp. In the end I have settled on the fork 20mm above the top clamp, I have room to go a bit more if I need to. It has good even rebound and compression on the front and back wheels. The ride height has me on the balls of my feet and I'm 6F 2" tall and the steering is smooth lock to lock and nice and stable. I'm as ready as I can be for the bush to give the final check and declare success! All up with forks, triples, bearings and wheel assembly I got out of this for just under $500 and now have the added benifits of upside down forks. If anyone’s interested to can give some further detail on how to do the same if they wish. considering what you started with , probably the best way to go . Im guessing a few more people might have a go at this once they see it . Good job ..
awesome work. got me thinking about it. cant wait to hear how it handles some treatment out bush. The final verdict is in and I’m very happy and proud to declare success! A couple of hours yesterday and I'm really happy with the result. The bike has so much more feeling and response back up through the bars now while also being very stable when you open it it up in 3rd and 4th gear. It’s also a lot more forgiving at attacking any obstacles in your way. It's a totally different bike now in all the right ways! Like I said if anyone wants a hand or some more info of what and how I did it, don't hesitate to get in touch with me.